Background: Hairy-cell leukemia (HCL), lymphoproliferative disease of older age, is characterized by projections from surface of abnormal cells. Aim: The aim was to study the clinical presentation and ultrastructural changes in hairy cells (HCs) following cladribine treatment. Settings and Design: Clinical presentation, peripheral smear, bone marrow aspiration and biopsy of HCL cases diagnosed over a period of three years were reviewed. Materials and Methods: Consecutive HCL cases in Hematology clinic of a tertiary care center were enrolled. Tartarate-resistant acid phosphatase (TRAP) test was done to detect HCs and electron microscopy was done to demonstrate initial ultrastructural changes and alterations following cladribine therapy. Results: Fifteen cases of HCL, aged 32-57 years (median 47 years) were studied. The clinical presentation included splenomegaly in 15 (100%), fever in 10 (67%), hepatomegaly and pain abdomen in eight (53%), fatigue in nine (60 %) cases. The commonest laboratory features were monocytopenia in 13 (87%), neutropenia in 12 (80%), anemia in 10 (67 %) and pancytopenia in nine (60%). All patients showed symptomatic improvement on cladribine therapy. Electron microscopy after treatment (three months) showed loss of the finger like projections, characteristic bald lymphocytes, loss of ribosomal lamellar complexes, as well as decrease in mitochondria and vacuoles. Conclusions: Indian patients with HCL are younger. Cladribine is an effective therapy for these patients and leads to complete response in most of the patients. There is a significant improvement in the ultrastructural features following cladribine therapy. 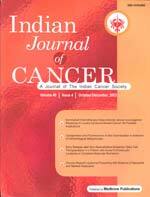 © Copyright 2008 Indian Journal of Cancer.